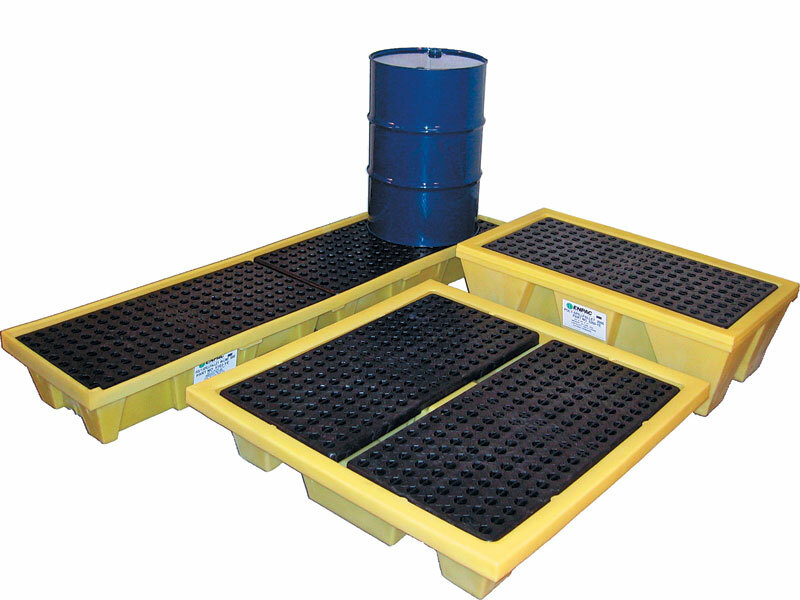 Drum spill pallets are ideal for containing leaks and spills from industrial containers, as well as enabling the safe and efficient handling, transportation and storage of these units. Every worksite that regularly handles fuel drums appreciates that having the right equipment for the job is essential to a quick and safe result. While traditional equipment can easily hold the weight of steel drums, the drums’ unique dimensions pose several problems. The Workplace Depot is excited to offer the Drum Spill Pallet, which provides an innovative and easy-to-use solution to these issues. 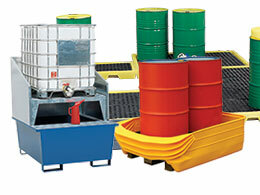 What is The Purpose of the Drum Spill Pallet? Being able to move drum consignments swiftly and store them efficiently can prove very valuable for saving energy as well as time and space. The width and length of the pallet features raised edges, helping to position and stabilize the drums on the base. In addition to providing more stability, the pallet is also designed to catch drips, leaks and spills, helping businesses to keep their storage areas clean and safe and comply with important regulations. Fuel companies, shipping yards, and construction sites all utilize fuel drums on a regular basis. The aligned formation and compact shape of the pallets makes them ideal for storing close to walls and permits stacking during shipments or when drums are not in use. This both reduces the cost of bulk shipping and optimizes floor and storage space in general loading areas where space is constricted. Fork lift operators, construction site managers, and other industrial workers can all benefit from having this valuable item on hand. This product is designed to be easily used and transported and has convenient forklift pockets, meaning it can be handled, positioned and relocated with ease by forklift operators. 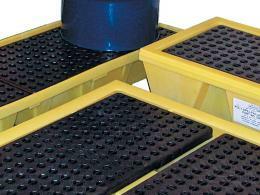 Its removable black textured grating is non-slip, adding traction and making for easy cleaning. The drum spill pallets are strong enough to support two or four 210 litre drums and feature a sump capacity of 250 litres. 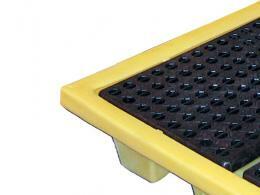 The pallets are constructed from durable and high density yellow polyethylene, providing excellent chemical and corrosion resistance. They are built to last and are fully weatherproof. The pallets can be delivered within 3 working days and we promise to match any price. We also provide a one-year guarantee, so order your product today!